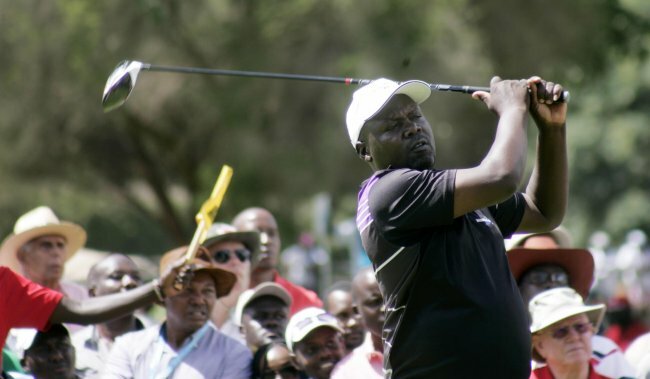 Kenyan hopes were raised when veteran Dismas Indiza Anyonyi began his round with back-to-back eagles and moved into a share of the lead, but he faltered coming in and finished on six under par, seven shots behind Soderberg. Other Kenyans in the tournament who include Simon Ngige and Brian Njoroge finished T57 and T38 respectively at par 216 and 3-under 213 respectively. Indiza started off on a firing note hitting two eagles on the first two holes and sinking a birdie on the third. He grabbed an ugly double bogey on the 6th and another on the 9th before parring on 8 holes on his back nine and scored a bogey at hole 11. The 25 year old Swede started the day one shot behind South Africa’s Jacques Blaauw, but seven birdies put Soderberg on 13 under par going into the final round of the European Challenge Tour’s season-opener. The Gothenburg native’s previous best finish is a tie for third at last year’s EMC Challenge Open but he showed few nerves as four birdies in five holes around the turn gave him a cushion at the top of the leaderboard. “I definitely felt more pressure today but I think I managed it pretty well,” he said. "I might look calm on the outside but there’s definitely pressure – I like it though, you’re looking to put yourself in that position. “I started off so-so on the front nine but I really got it going around the turn and after that it felt pretty good, and it was great to finish with a birdie as well. “I was just trying to stick to my game plan, I figured someone was going to shoot a good number and I didn’t really change my approach, just hit some really good putts which gave me some momentum." By far the biggest climb on moving day came from Frenchman Joël Stalter whose superb 64 broke the course record and moved him into a share of second place with Germany’s Sebastian Heisele.